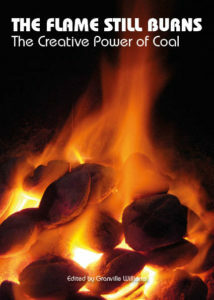 With Banners Held High focuses this year on the ‘The Flame Still Burns-The Creative Power of Coal’. 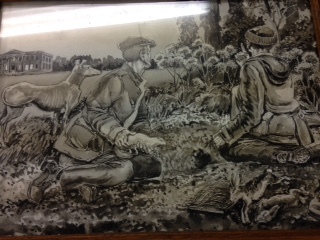 It celebrates an industry which inspired films, books, plays, paintings and much more. 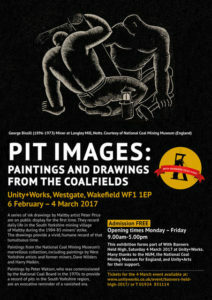 The event, on Saturday 4 March at Unity+Works Wakefield, links into the art exhibition Pit Images: Paintings and Drawings From the Coalfields running at the same venue. 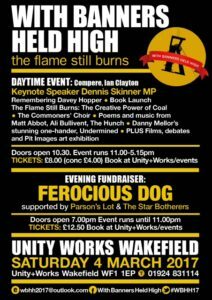 The compere for the day’s event is writer and broadcaster Ian Clayton and the keynote speaker is Dennis Skinner MP. Highlights of the day include Danny Mellor’s stunning one-hander, Undermined, and a celebration of the life of Durham miners’ leader, Davey Hopper, who died last year. He played a key role in ensuring the survival of the Gala. A new book, The Flame Still Burns: The Creative Power of Coal, specially commissioned for the event, will also be launched on the day. The packed programme includes films, poetry and music with Matt Abbott, Ali Bullivent, The Hunch and the Commoners’ Choir. 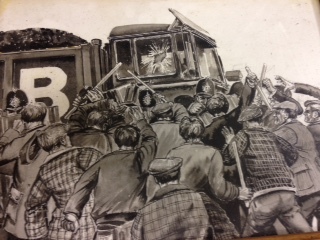 Also a series of workshops/debates link issues from the 1984-85 miners’ strike to contemporary concerns. 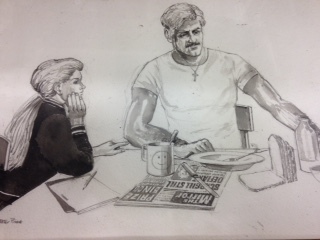 Topics include ‘From Coal Not Dole to I, Daniel Blake’, ‘Media and the Miners’, ‘Music, Politics and the Miners’ and ‘The Legacy of Thatcherism: Zero Hours Contracts’. Buy today to avoid disappointment! Our new poster just out. Spread the word! 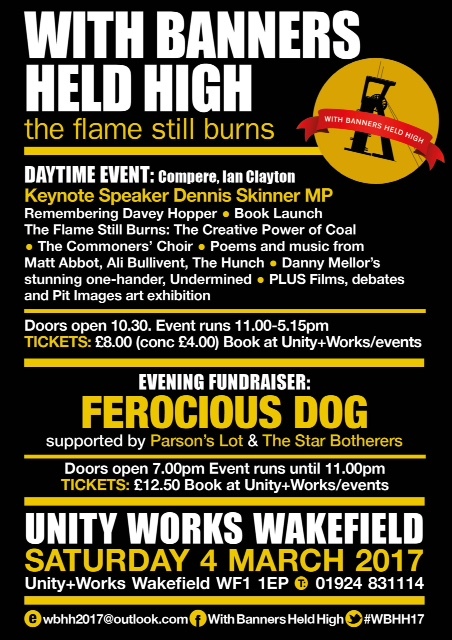 work at With Banners Held High on 4 March at Unity+Works, Wakefield. 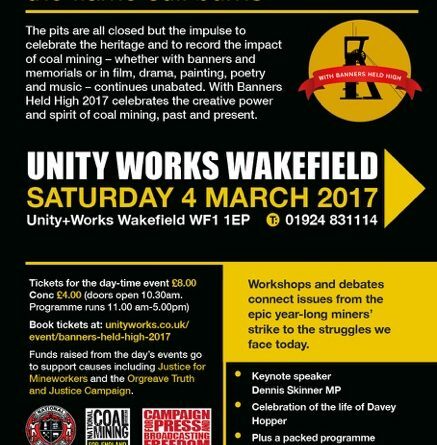 Dennis Skinner, MP for Bolsover, is a keynote speaker at With Banners Held High, Unity+Works, Wakefield on Saturday 4 March 2017. The theme of the day event is ‘The Flame Still Burns’ and it will celebrate the fact that although the pits are now all closed the impulse to celebrate the heritage of coal mining continues unabated. There is a packed programme of exhibitions, music, film, poetry and debates -compered by writer and broadcaster Ian Clayton – and a new book, The Flame Still Burns: The Creative Power of Coal Mining, will be launched on the day. 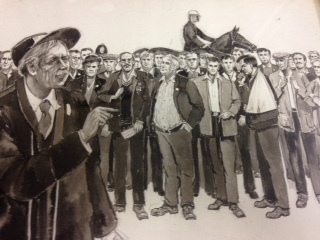 One focal point of the day will be a celebration of the life and work of Davey Hopper, President of the Durham Miners’ Association, who died this year. Another will be the performance by Danny Mellor of his stunning one-hander, Undermined. 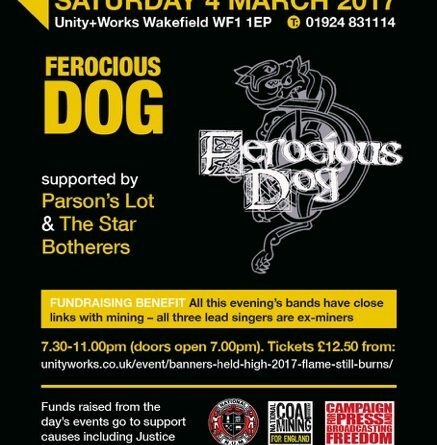 The evening fundraising event is headlined by Ferocious Dog with support from Parson’s Lot and The Star Botherers. 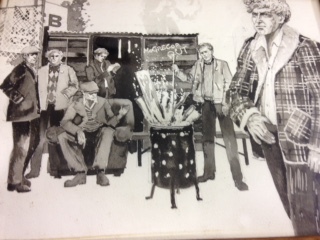 The bands have close links with mining – all three lead singers being ex-miners. 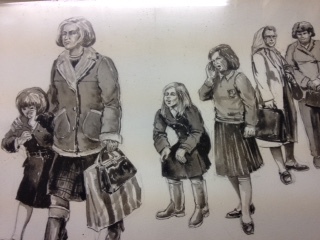 We are pleased announce that we discovered the artists name and background of these fantastic paintings Peter Price from Maltby the art work along with background story will be on display at With Banners Held High in Wakefield March 2017. We are delighted to announce that Danny Mellors play undermined will be part of the days entertainment at with banners held high 2017. Flyers for the With Banners Held High event being held at Unity+Works Wakefield on 4 March 2017. Please download and share our flyer for With Banners Held High 2017. 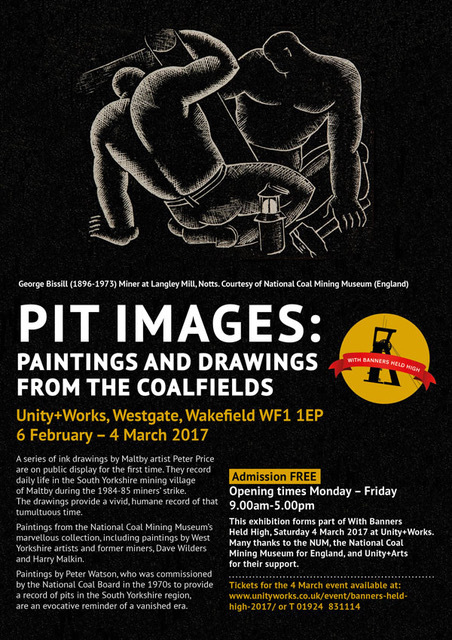 The pits are all closed but the impulse to celebrate the heritage and to record the impact of coal mining – whether with banners and memorials or in film, drama, painting, poetry and music – continues unabated. With Banners Held High 2017 celebrates the creative power and spirit of coal mining, past and present. 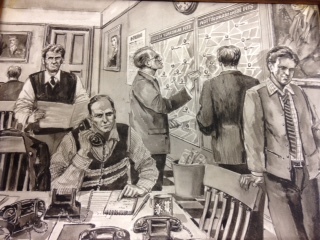 Workshops and debates connect issues from the epic year-long miners’ strike to the struggles we face today. The first announcement for the next With Banners Held High, is that Ferocious Dog will be headlining the event! Tickets available for the night event here!